From small groups and troops to entire organizations, I Heart Hungry Kids events are an inclusive, hands-on way for groups to impact the lives of thousands of kids. Below are some examples of ways that groups are working with us to make a difference. From the very beginning, Debbie Petitpain and Sodexo have been regular sponsors of our volunteer break room, working with us to develop monthly education for kids and parents on healthy eating habits and tasty nutritious snacks. In 2018 the Cooper School chose the theme of hunger for their annual poetry publication, Pass It On, and donated proceeds from the sale of the books to I Heart Hungry Kids. Cooper School students are a regular at Packing Parties! The First Baptist School students often help at Packing Parties, and chose I Heart for their annual school-wide change drive, raising thousands of dollars to help kids fight hunger in the community. Molina Healthcare employees selected I Heart Hungry Kids as their charity of choice for their annual grant and service project. Employees and their families pitched in while raising awareness through their corporate outreach efforts. 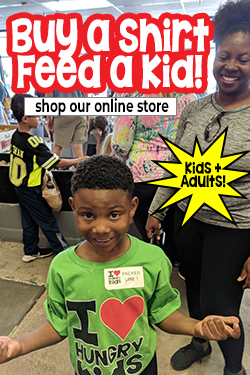 If you’d like your group to participate in a Packing Party, or wish to include I Heart Hungry Kids as part of your community event, outreach, or food drive, please fill out our online questionnaire to get the process started. The American Heritage Girls, the Boy Scouts, Girl Scouts, and Cub Scouts have all made I Heart Hungry Kids part of their community outreach, organizing fundraisers and participating together as a troop at Packing Parties. Grace Church Cathedral in Charleston has supported I Heart Hungry Kids with grants from their annual Tea Room and Boutique fundraiser, and kid parishioners (and their parents) often attend Packing Parties to help out. Citadel Cadets have been participating in Packing Parties for years, lending a hand in everything from boxing food and stacking crates to preparations and registration – even push up demonstrations! Ashley Hall Choral Director Katherine Clarkson lead the Upper School chorus, along with poets from the class, and focused their annual concert on hunger, with proceeds donated to I Heart Hungry Kids. Get registered for upcoming Packing Parties, special events, and news about ways kids can make a difference in our community by entering your email below!